"The doctors and staff are caring and friendly." "The staff is always very kind to me and very helpful. Wait time is always low." "The staff here is great. They are friendly and efficient." 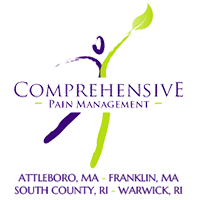 Entering its second decade, Comprehensive Pain Management uses an integrated and multidisciplinary team approach to bring the most well-rounded, up-to-date, and effective pain management techniques and practices at four locations in Massachusetts and Rhode Island. With double board certifications in anesthesia and pain medicine, co-founders Do Chan, MD, MBA, and Boris Shwartzman, MD, have completed training at some of the most prestigious medical centers in the world, including Beth Israel Deaconess Medical Center, Tufts New England Medical Center, and St. Elizabeth’s Medical Center. Comprehensive Pain Management offers both interventional pain treatments and responsible and caring medication management. With convenient locations in Attleboro and Franklin, Massachusetts, and in South Kingstown and Warwick, Rhode Island, and only short wait times at their offices, the team makes it easy for their patients to get the care they need in a timely fashion. Dr. Chan, Dr. Shwartzman, and the Comprehensive Pain Management team bring more than 10 years’ experience in providing superior pain management care, supporting their patients’ active and healthy lifestyle. These quick and relatively painless procedures require only local anesthesia, but intravenous sedation is available for most of the procedures in order to alleviate anxiety and minor discomfort associated with the procedure. You will receive detailed pre and post procedure instructions and our friendly staff is always there to answer any additional questions you may have. Is Lower Back Pain Holding You Back From Doing the Activities You Love? Do you have lower back pain that makes you miss work? Do you avoid certain activities because you’re worried they’ll cause your symptoms to flare up? You don’t have to sit on the sidelines letting lower back pain control your life; we have solutions. Looking for a drug-free solution to the intense pain and immobility caused by compression fractures? Consider kyphoplasty. It’s an outpatient procedure that can restore movement and relieve your pain and usually takes about an hour to perform. Overactive Bladder Syndrome (OBS) can seriously impact one's quality of life. "Regardless of who I see, I'm always treated with empathy and respect! They're always looking for new ways to alleviate my pain with new procedures..."
"Since my mother's fall, Dr. Chan and his staff have made sure my mother has been comfortable with limited pain. They truly care about their patients..."
"The staff is very knowledgeable, helpful, caring, and sensitive. They have helped me and if one thing doesn't work, we try together to find something else..."